(Office of Her Majesty, Press Department – Paris) In line with her efforts to promote Jordan and its culture and heritage abroad, Her Majesty Queen Rania Al Abdullah patronized "The Night of Jordanian Treasures," in Paris, and met with several UNESCO Goodwill Ambassadors on the occasion of their annual meeting. "Today, at a time when, too often, humanity is clashing instead of communicating, we need to promote [a] universal language and indivisible heritage," said Queen Rania. A number of Jordanian performers were on hand to promote that universal language and showcase a few wonderful examples of Jordan's remarkable performing arts. Pianist and composer Zade Dirani preformed his original compositions that blend oriental and contemporary western influences. The National Center of Culture and Art performed "Dabkeh", a community dance to celebrate weddings and other festive occasions; the National Music Conservatory then presented the group "Mahabeesh", which uses the "Mehbash", tool used to grind coffee, as a percussion instrument. Also performing was the Circassian Folkloric Troup of Al Ahli Club, who put on a beautiful display of the "Qafa", a royal dance describing the grace, agility and dignity of Circassians, and the "Islameh", a dance celebrating life and liberty. Queen Rania has said before that in order for different cultures to understand each other, they must let one and other into their homes, and see things first hand. Such cultural awareness nights serve to introduce members of different communities to some of Jordan's most special cultural secrets. In talking about Jordan, Her Majesty said, "located at the crossroads of East and West, and in the cradle of humanity’s great religions, we [in Jordan] have carved out a special role as a link between regions and cultures. We know tradition and modernity can both find purchase in our soil, and we are eager to bring the world to Jordan, and bring Jordan to the world." Her Majesty thanked all the UNESCO ambassadors and representatives for their efforts "'to build peace in the minds of men' and to foster dialogue, mutual respect, and understanding among the peoples of the earth." Some of the ambassadors in attendance included Princess Firyal, Sheikh Ghassan Shaker, Bahia Hariri, Princess Lalla Meryem, and Mehriban Aliyeva, the First Lady of Azerbaijan. Queen Rania and the first lady also met separately. The Queen also toured an exhibition featuring traditional and contemporary handicrafts produced by the Jordan River Foundation, as well as photographs of Jordan by Rana Safadi and Dana Khrais. Both photographers have had their work displayed locally and internationally. 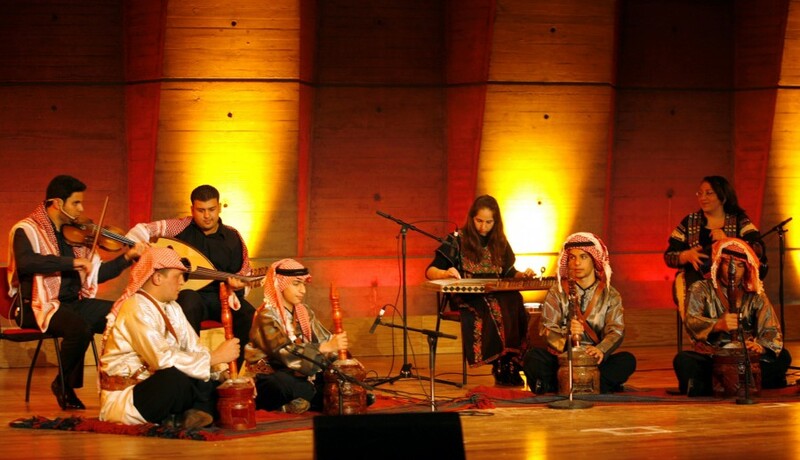 The cultural evening was organized by JRF, the Jordanian Embassy in France, and the Delegation of the Hashemite Kingdom of Jordan to UNESCO.